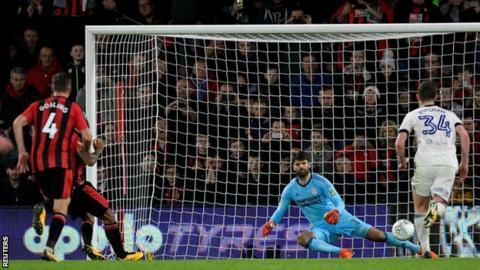 Callum Wilson scored on his first appearance since January as he helped Bournemouth beat Middlesbrough to move into the Carabao Cup quarter-finals. Cherries debutant Jack Simpson put the hosts ahead four minutes into the second half as he hooked in a volley from six yards out after Ryan Fraser's left-wing corner. Middlesbrough, 13th in the Championship, equalised seven minutes later when Marcus Tavernier converted after a fine run and pass from Adama Traore. But Wilson, playing his first game after a serious knee injury, put the hosts ahead from the penalty spot after Dael Fry had fouled Simpson in the area. The Premier League team sealed the victory when Benik Afobe slid in a third from close range after Wilson's low cross. Bournemouth have now reached the last eight of the competition for a second time in four seasons. Wilson, 25, ruptured an anterior cruciate ligament in his left knee during a training session at the start of February, and had suffered a similar injury on his right knee during the 2015-16 season. "The biggest compliment I can give Callum is that he's played 90 minutes and it didn't really look hard for him, physically," said Cherries boss Eddie Howe, whose side host Chelsea in the Premier League on Saturday. "I think his overall performance gives me something to think about. "We've got competition in that area, for sure. I'll have a few sleepless nights, if everyone's fit, trying to pick a team and pick a bench but that's what you want. "I was very pleased with him, he's done his chances no harm." Howe's side are 19th in the Premier League and he made eight changes from the side that won 2-1 at Stoke on Saturday, while Middlesbrough made 10 changes from the team that lost 1-0 against Cardiff. The draw for the quarter-finals take place at 16:00 BST on Thursday, 26 October. Match ends, Bournemouth 3, Middlesbrough 1. Second Half ends, Bournemouth 3, Middlesbrough 1. Attempt missed. Patrick Bamford (Middlesbrough) left footed shot from outside the box is close, but misses to the left. Attempt saved. Adam Clayton (Middlesbrough) right footed shot from outside the box is saved in the centre of the goal. Corner, Middlesbrough. Conceded by Artur Boruc. Attempt saved. Stewart Downing (Middlesbrough) left footed shot from the left side of the box is saved in the bottom left corner. Attempt missed. Dael Fry (Middlesbrough) right footed shot from the centre of the box is too high. Corner, Middlesbrough. Conceded by Nathan Aké. Substitution, Bournemouth. Nathan Aké replaces Adam Smith. Substitution, Middlesbrough. Ashley Fletcher replaces Lewis Baker. Goal! Bournemouth 3, Middlesbrough 1. Benik Afobe (Bournemouth) left footed shot from very close range to the bottom left corner. Assisted by Callum Wilson. Jack Simpson (Bournemouth) wins a free kick in the attacking half. (Middlesbrough) wins a free kick in the attacking half. Attempt blocked. Jordon Ibe (Bournemouth) right footed shot from outside the box is blocked. Substitution, Bournemouth. Benik Afobe replaces Ryan Fraser. Substitution, Middlesbrough. Stewart Downing replaces Marcus Tavernier. Goal! Bournemouth 2, Middlesbrough 1. Callum Wilson (Bournemouth) converts the penalty with a right footed shot to the bottom right corner. Penalty Bournemouth. Jack Simpson draws a foul in the penalty area. Penalty conceded by Dael Fry (Middlesbrough) after a foul in the penalty area. Corner, Bournemouth. Conceded by Adam Clayton. Corner, Middlesbrough. Conceded by Steve Cook. Attempt blocked. Adam Forshaw (Middlesbrough) right footed shot from outside the box is blocked. Substitution, Bournemouth. Jordon Ibe replaces Lys Mousset. Attempt saved. Marcus Tavernier (Middlesbrough) left footed shot from the left side of the box is saved in the centre of the goal. Harry Arter (Bournemouth) wins a free kick on the left wing. Attempt missed. Callum Wilson (Bournemouth) header from the centre of the box is close, but misses to the left. Goal! Bournemouth 1, Middlesbrough 1. Marcus Tavernier (Middlesbrough) left footed shot from the left side of the box to the bottom right corner. Assisted by Adama Traoré. Foul by Lewis Baker (Middlesbrough).